While I Work On The Second*, Did You Know There Is A First? Every now and then I enjoy taking the liberty–since it is MY blog and all–of promoting my first book. 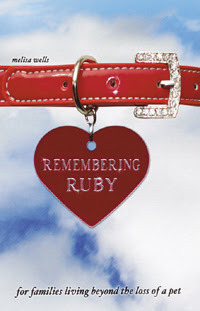 It’s a children’s book about pet loss called Remembering Ruby: For Families Living Beyond the Loss of a Pet. I wrote it after the death of our first beagle, Bijoux (bee-shoo), who lived a great life for her thirteen years on earth. *By the way, it is my deepest hope that I will have some news on my second book in the next couple of months. Fingers crossed! Even though it's more family geared, I cannot tell you how awesome it was to read this as our family was making the decision to possibly put our lab down. Even though we ended up not doing it (yet), it made me feel a million times better. I loved the first one and can't wait to read the second one! I remember this one from our cre8Buzz days. Keeping my fingers crossed for your second book.